“Let's go to Giethoorn, the village with no roads,” I said as we toured the Netherlands in our motorhome. Yeah, you can understand why my husband looked at me like I'd completely lost my mind! After all- we were on a road trip across Holland… and the village of Giethoorn has no roads!! Why would we go there? But I promise you, Giethoorn is easy to visit and it's definitely worth the effort! How to get to Giethoorn village? Can you visit Giethoorn from Amsterdam? Where to stay in Giethoorn with a motorhome? Is Giethoorn village worth a visit? Giethoorn is a small village in the north-eastern centre of the Netherlands. It's about 45km north of the city of Zwolle and it's easily visited in a day from Amsterdam. In fact, you can book it as an arranged tour if you're not travelling with a vehicle. Giethoorn is often called the ‘Little Venice' of the Netherlands. Having never been to Venice, I can't compare the two, but I've seen pictures and I'm willing to bet the only similarities between the two is the fact that there are canals, a few boats and THOUSANDS of tourists! Giethoorn fought off many other competitors to achieve a place on the new International Monopoly board. Yep, you can check it out HERE! 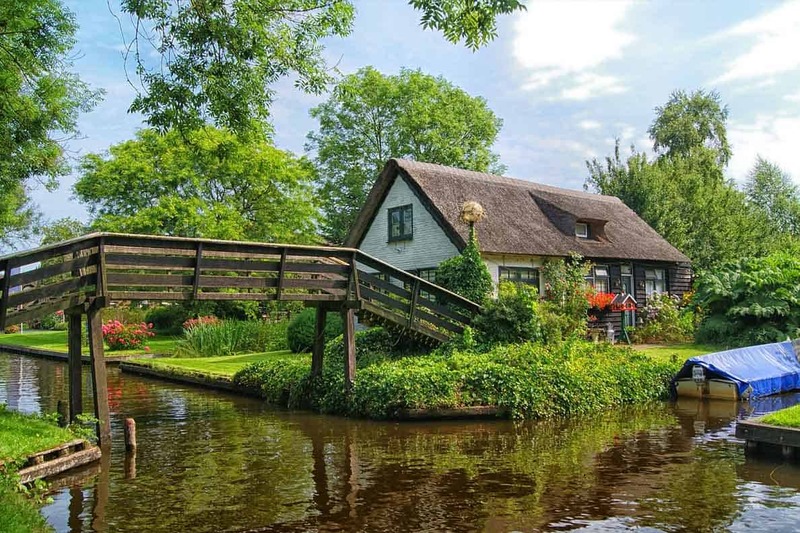 Giethoorn is a town where about half of the houses are only accessible by foot, bike or small boat. The population is around 2,600 and there are over 180 bridges!! For some reason why I haven't yet figured out, it is a HUGE attraction for Chinese visitors. The small town gets more than 150,000 Chinese visitors every year– as well as all the other nationalities! We chatted to a lovely Dutch couple, and they have no idea why it's so big with Chinese tourists- apparently, the tourist board did their job well!! Yet weirdly, Giethoorn doesn't feel that touristy. Yes, there are shops selling knick-knacks and there are multiple restaurants and ice cream parlours, but most of them are very well presented and in keeping with the quaint feel of the village, so you barely notice them unless you're looking for somewhere to stop. There are almost two different parts to Giethoorn. There's the ‘normal' town, which honestly looks like a million other towns across Europe. This is where the marina and motorhome parking is. HOWEVER, if you walk across the road and down by the canal (it's not very well sign-posted, but ask someone or follow the crowds!) and you'll see where the magic starts. First of all, you'll come to a looooooong straight section by the canal with loads of restaurants and ice cream parlours. You can rent a small electric boat to explore Giethoorn- which is an AMAZING way to spend an hour or two. You need to follow the signs and pay attention to other users of the waterways, but you don't need any training or paperwork- just rock up. Dogs are welcome in the boats too- be careful they don't fall in! Word of caution– most of these boats are aluminium. On hot days they get HOT. Crazy hot. You have been warned! Whether you explore by boat or on foot, go to the end of the long straight section. This is where the section without any roads is- and it's ridiculously pretty. Take a photo on one of the 180 bridges, walk around the various pathways and just enjoy the ambience. It's fairly quiet- these are people's homes after all- but just being there is a real treat. We stayed at a motorhome campsite about a 10-minute walk from the historic village, right on the banks of the Giethoorn marina. When you park up, you need to walk into the reception building. There was no one around when we arrived- luckily there was another English motorhomer who helpfully showed us the ropes. Inside the building, you'll find a payment machine. Here you pay for your overnight stop (and you'll receive a printed ticket to put on your dashboard). You have to pay with card, not cash. You ALSO need to buy a payment card, which you can use for electric, showers, toilets and laundry facilities. This card costs 5€ and comes with 3€ credit. Again, you need to pay this on your card, not cash. Every time you want to add credit to the card (you can't add credit at the beginning) you need to use your card to top up- if you get international bank charges this really adds up! Anyway, so far, so good. We have a card, we have 3€ credit and therefore we can get electric. To get electric, you hold your card over the appropriate scanner and press the button. The problem came when we needed to do our laundry– a necessary evil of long-term travel! The washing machine at Giethoorn is actually very reasonable at 4€/ time. To use this, select your programme, put in your clothes & detergent, close the door… and then prepare to pull your hair out! You need to hold the card over the scanner until it shows it has taken the money off… then you need to quickly remove the card so it doesn't take MORE money off! The first time I did this, I wasn't quick enough… so it took an extra 4€ off the card. The same thing happened the second time… I'm now down 8€ and have to go top up the fricking card AGAIN. The wash cycle takes about 45 minutes, depending on the programme you choose, so we decided to go for a walk whilst it was doing its thing so we could return and put it into the dryer (also 4€/use). The sunset was beautiful- it really is a pretty place. Somehow, somewhere, on that walk… I lost the card. Yep, the one we'd just topped up after I'd been robbed of 8€. There are no staff around to appeal to- we didn't see a single person in the office the whole time we were there. So we had to go buy another card… and then top it up AGAIN. We're now down about 15€… and I didn't want to play anymore. None of this is the marina's fault exactly… but the system is pretty confusing if you've never done it before, so be warned. And maybe don't do your laundry there. There are other much simpler places to use on your travels! Ok, rant over. Thanks for sticking with me! Laundry machines aside, we really enjoyed visiting Giethoorn village. It's an incredibly beautiful, peaceful place and so different from anywhere we've been before. It was surreal seeing so many beautiful houses with absolutely no roads connecting them. For someone who loves boats so much, it was pretty much my heaven! Every now and then a house does come up for sale- keep your eyes peeled!! If you're travelling in The Netherlands, add Giethoorn to your itinerary. Have you ever been to Giethoorn? What did you think? Let me know in the comments below. Enjoyed this post? Want to save it for later? Pin it to your Netherlands or Europe board on Pinterest! Travelling in a Motorhome? Do this IMPORTANT thing BEFORE you go!